Designed for demanding networking engineers, this three hour advanced technical webinar is full of design and configuration guidelines and tips that will help you build and deploy scalable DMVPN networks. Routing protocol design guidelines for OSPF, EIGRP and BGP. NHRP configuration, including NHRP multicast maps and NHRP operation in dial-up networks with dynamic transport IP addresses. Basic IPSec configuration with shared keys and certificates. Redundant network design with each spoke router being connected to two hub routers. After describing the changes introduced by Phase 2 DMVPN (dynamic spoke-to-spoke tunnels) and their impact on routing protocol design (OSPF, EIGRP and BGP), this section details the default routing issues caused by IPSec tunnels established with unknown destination addresses and the shared IPSec protection profile caveats. This section presents several solutions to the default routing issues introduced with direct spoke-to-spoke tunnels, from policy routing to split default routing with Virtual Routing and Forwarding (VRF) tables. Connections to two Internet Service Providers are usually used to increase the availability of DMVPN spoke sites. 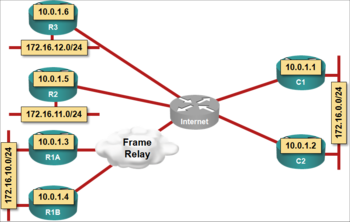 Simplistic implementations of dual uplinks can easily fail if the ISPs perform strict source IP address checking (usually with Reverse Path Forwarding – RPF – mechanisms). This section describes tunnel route-via feature introduced in IOS release 12.4(11)T and an alternate design that works well with encrypted traffic. OSPF can become a bottleneck in DMVPN designs with high spokes-per-hub ratio. A simple distance vector routing protocol (RIP or ODR) scales much better than OSPF (with obvious convergence drawbacks). This section describes a network design where the spoke sites with multiple routers use OSPF while the sites with a single router (still connected to two uplinks) use ODR, which is then redistributed into OSPF. Spoke sites running OSPF receive full complement of routes, while the spoke sites running ODR receive just the default route from the hub routers. Simplified scalable routing comes with a price: spoke routers receive just the default route from the hub routers, not the detailed routing information needed to establish spoke-to-spoke tunnels. DMVPN Phase 3 solves this problem by introducing dynamic hub-to-spoke redirects and spoke-to-spoke shortcuts. This section describes Phase 3 configuration and design caveats caused by DMVPN-specific limitations of NHRP. As the number of spokes per hub grows, the multicast replication on the hub router becomes a bottleneck. To scale a DMVPN network beyond this bottleneck, you have to deploy a combination of distance vector routing protocol and reliable static routing, making the hub router totally passive (from the routing perspective). Unidirectional routing (or BGP) allows you to grow the DMVPN cloud to the point where you hit the architectural and IPSec limits of the hub routers. At that point, you have to introduce a hierarchy of hub routers and carefully design the routing protocols and NHRP if you want to retain any-to-any connectivity with hub hierarchy. Twenty sets of complete router configurations covering every single design scenario described in the webinar are included in the webinar materials. The seven router lab topology emulates an enterprise DMVPN deployment with a redundant central site (with two hubs), a redundant remote site (with two routers) and two non-redundant remote sites (using two uplinks in a few scenarios). The seventh router emulates the Internet. The configurations can be used on any hardware (real or otherwise) supporting recent Cisco IOS software, allowing you to test and modify the design scenarios discussed in the webinar. To attend this webinar, you should be very familiar with IP routing and IP routing protocols (CCNP-level knowledge is highly recommended) and have rudimentary knowledge of GRE and IPSec. Excellent content, explained in a way that is easy to follow and Ivan keeps you interested the whole way through. Just a great overview of DNVPN; well structured with insight to the reasoning behind the technology. I’d recommend to supplement via building the appropriate labs as this helps in following the various DMVPN phases. Top marks🤓. There is no such information on the web. It has both theoretical and practical info. After spending time on the webinar, an engineer/architect does not have to read or listen to anything else. The materials presented are absolutely helpful to understand current market offerings in vendor neutral perspective! Simply one of the best presentations!